Be warned that Virgo Babies are particular and need to have a routine. This baby may not respond well to a lot of sudden change, so try not to disrupt their routine too much! On the plus side, you can get a lot of breather in between as the Virgo Baby has little need for the attention of others. Your baby can amuse itself for hours with the most basic of games. Your baby will most likely start talking at a very early age and you can be sure that your little one will not hesitate to speak what’s on their mind. 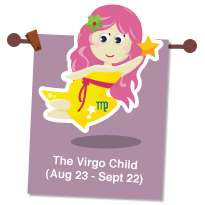 Virgo kids are sensitive to their surroundings and may tend to be fretful and anxious. So help your child relax and enjoy the simple pleasures of life by sticking to a structured daily routine going for regular walks.